Navigating Public-Private Partnerships – Information and thought leadership on this dynamic market! 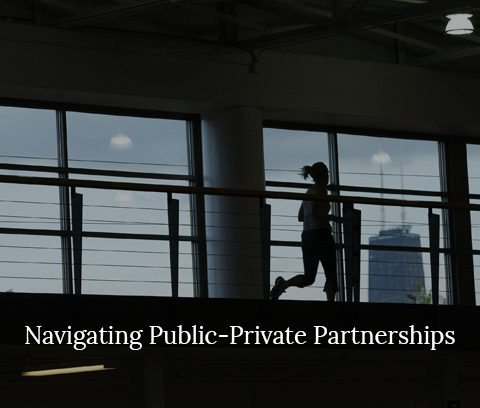 Public-private partnerships (“P3”) have become an effective option for institutions to pursue their strategic objectives while managing a project’s speed to market, navigating complex political environments, leveraging financial capacity and expertise, and transferring risk and return to the appropriate parties. As the range of P3 development structures continues to expand and provide exciting opportunities, the introduction of innovative project structuring accentuates the fact that public-private partnerships are not off-the-shelf deal structures. Instead, the deal structures of today are multi-variable equations that easily can become overwhelming. The complexity of these structures is further amplified by the P3 industry’s lack of established governing bodies or consistent terminology for its transactions, leaving many institutions with questions about how (or if) to pursue one. As the industry continues to evolve, an increasing number of B&D’s clients are asking for support as they consider whether to pursue a P3 arrangement. B&D’s extensive public sector experience serving higher education, PK-12 school, municipal, and other clients, as well as development advisor experience with nearly $2B in P3 transactions, give us significant insights into how such transactions should be managed. Listed below are five important considerations for balancing institutional control with developmental risk, ultimately driving greater value throughout the decision-making process. The project champion should be responsible for leading a process that drives outcomes, aligns key stakeholders, and engages third-party advisors. This person does not need to be the ultimate decision maker, but she must drive a process that keeps the project objectives at the forefront of every decision. An inspired institutional mission drives the most successful developments by providing a framework for projects with trans-formative potential. A project’s value is created by that vision, and success is measured by how it advances the institution’s goals and ensures that the strategic vision remains the centerpiece of any project. The institution should analyze market depth and financial output to determine the underlying project economics prior to soliciting a “private” partner. Defining project feasibility, including available revenue streams, at the outset will mitigate potential risk, allowing greater control in selecting a development structure that best fits institutional goals. Instead of focusing on one specific deal structure, the institution should strike a balance between framework and flexibility to take advantage of the evolving market opportunities. Caution is important during this process since flexibility without framework can create an unintended consequence of uncertainty for the private partner and potential loss of control for the institution. The structure should identify fixed components (high-intensity framework) and variable components (high-intensity flexibility) to create a balance that maximizes value. Normalizing the variables in multi-variable deal structure proposals is one of the most intricate and critical objectives during the solicitation phase. When variables are too complex, interested parties may be unable to define ways to engage in a viable partnership. As a result, an apples-to-apples comparison of respondent qualifications cannot be achieved. Successful P3 projects utilize a structured selection process that ensures clarity and consistency from proposers and translates project outcomes into a format of normalized variables that captures the value of reduced project risk.